DIEGO MARADONA HAS described Andres Iniesta as playing “with a tailcoat, wearing a suit”, but stands by his assessment that Sergio Ramos is not a star player. But Iniesta – who joined Japanese side Vissel Kobe in May after a nearly two decades with Barcelona – was at his imperious best against Portugal, Iran and Morocco, leaving Argentina icon Maradona to purr over his seemingly effortless brilliance. “Iniesta is a total star,” he told Marca. He is less convinced about Real Madrid’s Ramos, though, who Maradona believes is not as good as his Atletico Madrid rival Diego Godin. Ramos has since responded by saying Maradona is light years away from Lionel Messi as Argentina’s greatest ever player, and the 57-year-old is in no mood to go back on his assessment of the combative defender. “If Sergio Ramos wants, I apologise, but I will not change my purely football thinking,” he added. “He is a great player, he is a great captain, he can become a good leader, as we see in Real Madrid, but not a star player. Meanwhile, David De Gea’s position in the team is reportedly under threat after a high-profile error in the opening 3-3 draw with Portugal, but Maradona feels the Manchester United goalkeeper should be given time. “Since I’ve seen him at United, he has had a very good career, without ups and downs,” he added. “He has made Sergio Romero always substitute, which has its merit. Maradona also had praise for Diego Costa – a player he perhaps sees more than a little of himself in. “Diego is a warrior, I always want him in my team,” he said. Email “Iniesta plays like he is wearing a suit - Maradona”. 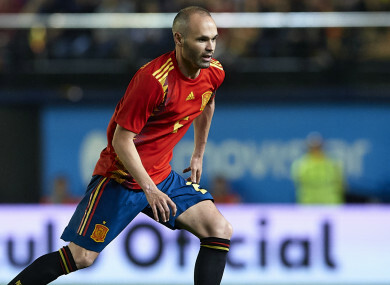 Feedback on “Iniesta plays like he is wearing a suit - Maradona”.